My name is Innocent Munyeshuri. I am a twenty-three year-old Rwandan citizen studying drama and education at the College of Education at the University of Rwanda. 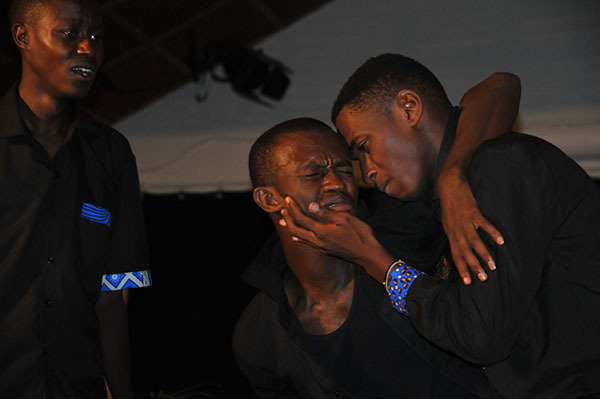 In August of 2013, I played Mercutio in Youth Bridge Global's production of Romeo and Juliet in Kigali. I really appreciated this role because I was able to see just how much the audiences enjoyed Mercutio and took pleasure watching me bring him to life on stage with his great affection for Romeo and his crude sense of humor. I felt very connected to this character, and it felt natural for me to portray him. I am looking forward to this golden opportunity to attend the training workshop at Shakespeare and Company. The experience will enrich my career--both as an actor and as an aspiring director. I hope to learn and grow immensely from this training, and I will enjoy the chance to make new friends. I very am eager to learn from this experience, and I am open to learn from any other opportunity the future may hold. I truly love theater! I can't wait to see you!